Rhodes marina is located at the island of Rhodes next to the island’s Central Port and only 14 km away from the Rhodes International Airport. Rhodes is the largest of the Dodecanese islands at the Aegean Sea, one of the best sailing & cruising areas in Europe and has been rated among the top ten vacation destinations Worldwide, with approximately 3.000.000 tourists per year. The island of Rhodes is situated in the South Eastern part of the Aegean Sea some 260 nautical miles from Piraeus (Athens main Port) and approximately 10 nautical miles southwest of Turkey. 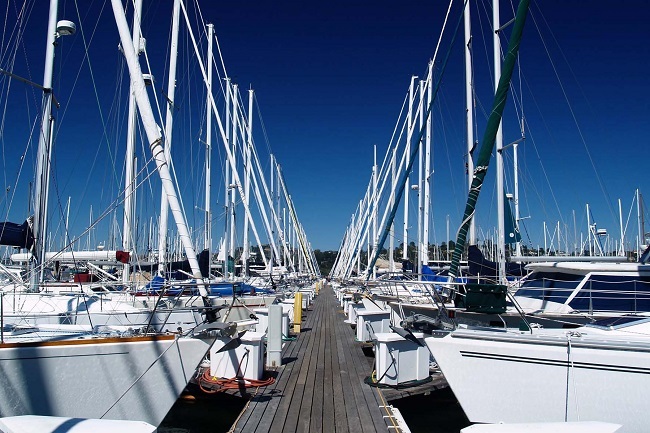 The marina features approximately 600 berths and accommodates a wide range of yachts from 30ft to 200ft and could host a boat up to 600ft. An extended fibber optic network provides each berth with tv, telephone, internet and remote control monitoring of electrical and water consumption. All the Marina Area is covered with wifi Internet. Security is provided through the use of a CCTV system. Most of the docking area is also protected through an access control system. The entire Marina Area is also equipped with a public address system. The Marina, which is constantly developing, consists of a total of 120.000 sq.m. land area. Rhodes Marine with its 600 meters waterfront esplanade lined with fine dining and shopping venues offers a cosmopolitan environment for yacht owners. Those who hope to get a mooring place in the town port of Rhodes during the high season, are looking for a needle in a haystack. However, Rhodes marina is a great place to start your Mediterranean adventure, among the Dodecanse islands or even the Turkish coast. Mooring your boat in this marina is a real privilege since the Rhodos Mandraki marina is actually the old town harbor. Now if you remember your history, the entrance of the old harbor of Rhodos is said to have been guarded by the Colossus, one of the 7 wonders of the ancient world. Sadly, the Colossus is long gone but the Yacht Charter sailors can still enjoy that ancient mystique in a modern setting. The marina is located in the north part of Rhodos island, along the other ports of the old town, being the furthest to the north, with the coordinates 36°26′ N 28°14′ E. From out at sea, the marina is easy to spot thanks to the medieval castle that sits just above it on a hill. Also, opposite the marina, the Yacht Charter skipper can see the main market street. The fact that the Mandraki marina is actually the old town port means that it’s not going to offer the facilities of a modern private marina, but regardless of that fact, it seems to be very popular with the Yacht Charter crowds, especially during the summer months when a berth at this marina is very hard to come by. A reason for that could be the position of the Rhodes island and the Rhodea town in particular, a gateway to the Dodecanese island and even the shores of Turkey. Also, the marina is conveniently situated just 30 minutes from the airport by car and 20 minutes from the commercial ferry by foot. This connects with numerous Yacht Charter islands in Greece and with resorts in Turkey, such as Marmaris. Also, during the summer, the prevailing wind in the area is the Meltemi which blows from the northwest to the west with forces of 4-6 Beaufort causing some problems for Yacht Charter yachts. North of the port entrance there are rocks and shallow waters that should be avoided. The marina has 120 berths which are never enough during the summer months, a reason for which a booking in advance would be a good idea. Berths have water and power supply (220V) as well as the basic facilities of toilets, hot water showers, a mini market and grocery shops, a parking lot and a taxi stand for those Yacht Charter sailors with a trip around town in mind. However, there is an additional bus terminal within walking distance of the marina grounds, in case ther are things you can’t find there. Also within walking distance of the marina is Rhodes main commercial street where you’ll find a wide assortment of shops, banks and restaurants, everything a Yacht Charter tourist needs. Other than the fact that it gets busy during the summer time, the fact that the facilties here are pretty basic, Mandraki marina is really a great place to moor, since the ancient town of Rhodes is a starting point for many Yacht Charter itineraries in the Mediterranean.